Comments: Milton Keynes is a funny old place. Arriving into town the first thing you’ll see is the train station; a grand geometrical monolith adorned with reflective panes. It should be a sleek, modern gateway to the town, but in the context of Milton Keynes it’s an imposing embodiment of a soulless place. The ‘New Town’ of Milton Keynes, established in 1967, somehow manages that classic dystopian paradox of being both futuristic and totally outdated. Everything about the place feels meticulously planned and inhospitable as if the notion was fished out of Anthony Burgess, JG Ballard and Aldous Huxley’s prodigious minds. The MK Dons being a franchised club just epitomes the bizarre nature of it all. Surprisingly the pies weren’t mass produced concrete blocks defined by right angles. Nor were they the generic tedium of Pukka or Holland’s. No, the pies at ‘stadiummk’ (grammar is clearly too expressive for Milton Keynes) were locally sourced and entirely unique. They even had a branded Milton Keynes label on them, just in case you got absolutely wasted after the game, woke up in a ditch, and forgot where you were. Nope, you have’t landed in a dystopian totalitarian city run by drones, it’s just Milton Keynes on a hangover. 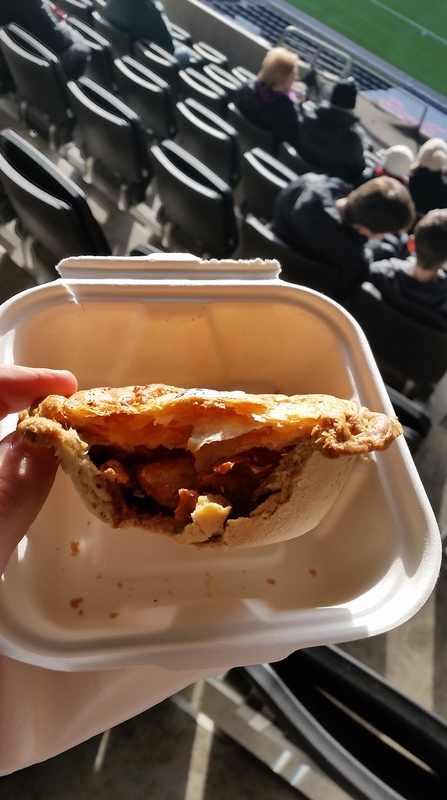 Below the rice paper crest, the pie found itself marred by weak foundations that created deep rooted structural issues, a bit like Fulham without a manager. The pastry was crusty and hard with all the tenderness of cooled magma. Churning the rigid clumps of clag through my mouth made me feel like I was enacting a cement mixer for an impromptu game of charades. It’s a shame the outer layer was so tough as the filling was nothing short of delightful. Balti pies all tend to have a similar curry based flavouring that’s eerily reminiscent of microwave ready meals, however this pie had a distinctly novel taste. The generous helpings of hearty chicken breast were awash with a fragrant and invigorating terracotta coloured sauce. It was as if someone had actually put some real thought into how they wanted the pie to taste, a novel idea indeed. I’ve failed to mention that is was absolutely freezing in Milton Keynes. It was so cold it made Ice Station Zebra look like a tropical sunbathing retreat. 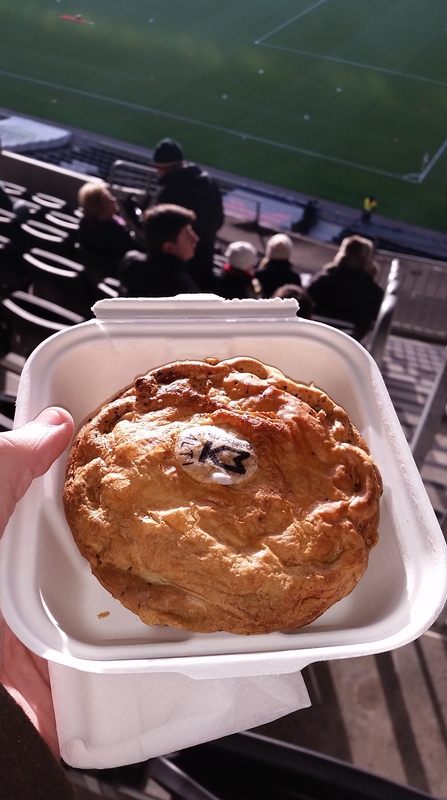 In times when your feet are so numb you start walking like a pissed up Ian Dury, a pipping hot pie seems the only refuge. Unfortunately my balti was what could be generously called tepid. With no pie warmth, no warmth amongst the crowds (as no one had turned up to support Milton Keynes), and no warmth in the football to jolt the cockles it was a very very cold outing. Sat in the near empty knock off San Siro that is stadiummk I learnt three things; one,Milton Keynes is as strange as it seems. Two, even Kit Symons is better than no manager. And finally, never go to an away game in November with just a Fulham shirt on – I’ve had to type this with my nose since my fingers haven’t yet thawed.